I love dessert soups. 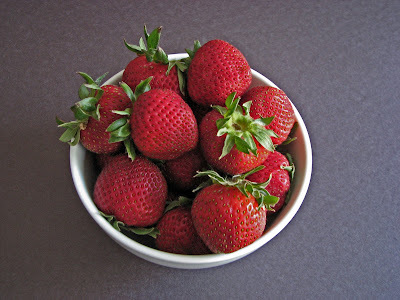 They are light, refreshing, simple and pure manifestations of the season’s best fruit. Preparation is always fairly minimal and the rewards are great. 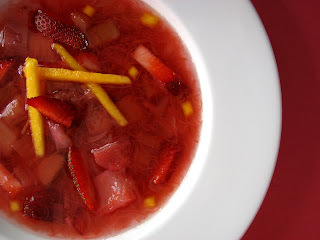 While we’re in the midst of rhubarb season, I thought I’d present a wonderful recipe for Rhubarb Soup from Simply Sensational Desserts by François Payard. I absolutely love Strawberry Rhubarb Pie, but sometimes we are searching for lighter fare on a warm spring night and this is a nice alternative. Rhubarb soup has all of the same bright tart flavors without any other textures or fat content to mediate the purity of the fresh fruit. This recipe is for rhubarb lovers and those who gravitate toward a nice level of tartness in their desserts. And the gorgeous color is a beautiful way to liven up your table. Take a drink of this incredible soup and you’ll discover a whole new way to enjoy rhubarb. - Payard’s recipe calls for Grenadine, which is a very sweet syrup used as a mixer in cocktails. It’s made from a base of corn syrup and, wherever possible, I try to avoid that ingredient. The term Grenadine is derived from grenade, the French word for pomegranate. It’s quite easy to replicate and has a much cleaner and fresher taste. 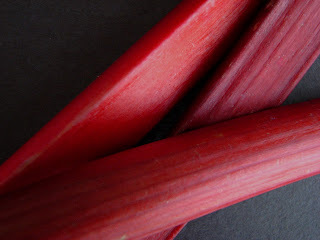 It should be fairly sweet to offset the tartness of the rhubarb, but taste it and adjust as you go along. If you want to make extra, it’s a good addition to lemonade. - I added just a little splash of lemon to the soup at the end to brighten the flavors. I think it makes a big difference. 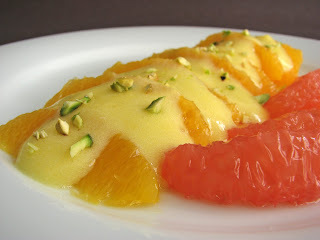 - Another nice garnish would be a small scoop of orange sorbet. 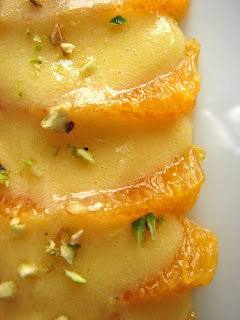 - Payard serves this at room temperature, but I prefer it chilled for a really refreshing dessert. Make a flavor sachet by placing the citrus zests and chopped lemongrass on a piece of cheesecloth. Tie together with string. 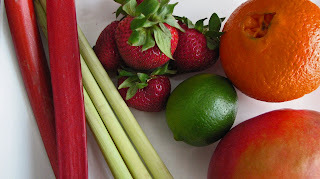 Bring the water and sugar to a simmer and add the rhubarb. Slowly bring the mixture to a boil, then remove from heat and add the flavor sachet and pomegranate syrup. Cover and let steep for 2 hours. Remove flavor sachet and whisk the soup to break up some of the rhubarb. Add a splash of lemon juice, to taste. 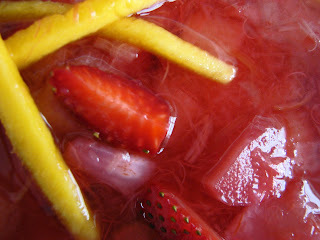 Prepare the fruit garnishes by slicing the strawberries and mango into matchsticks. To serve, place a heaping tablespoon of sliced strawberries in serving bowls. Ladle the soup into the bowls and garnish with a bit of mango. Bring 1 C of pomegranate juice to a simmer and reduce by 1/2. Add 1/2 C sugar and simmer until dissolved. Taste to adjust sweetness. It should be fairly sweet to offset the rhubarb, but not super sugary. Take off the heat and add just a splash of lemon juice. Set aside to cool. If you’re looking for a whisper-light dessert, this is the one for you. Maybe you’re serving a heavy meal or maybe it’s the last of many courses. Or maybe you’re not partial to rich desserts. Maybe you just want to be reminded of how perfect the simplest expressions of nature can be. Oranges with Rosemary Sabayon is a mere hint of a dessert that is very likely to remind you of a lovely little dinner al fresco on the shores of the Mediterranean. 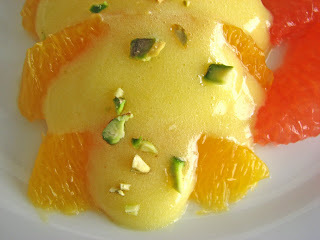 I love anything with citrus. I also love the scent of rosemary. One of the greatest moments of aromatherapy in a kitchen is savoring the fragrance of rosemary while chopping its sturdy leaves. Just fantastic. So I thought I’d pair the citrus fruit with some silky sabayon that has been infused with this terrific herb. It’s an unusual combination that blossoms into a wonderful complexity using just a few very simple ingredients. Celebrate Spring with this very easy, clean, simple and soft burst of flavor. - I’ve written about Sabayon in a previous post. It’s an amazingly easy and lovely dessert sauce. - I used a Nobilo 2007 Sauvignon Blanc from New Zealand, which was perfect. It has lots of citrus notes to bridge the rosemary, so I recommend you try to find a similar style. - I tossed in a couple of grapefruit sections for color. Not as perfect a match as the orange, but still good. I also garnished with a tiny bit of minced pistachio. - The Rosemary Sabayon would also be great with blackberries or figs. Yes, perfect with figs! 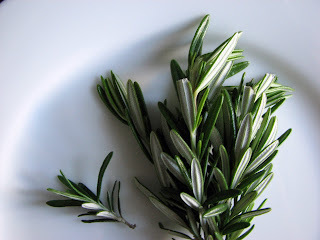 - Although you only need 3 T of Rosemary Syrup, the recipe makes over a cup. You can reduce the recipe if you don’t think you’ll use it, but it’s great in oatmeal, as a flavoring for whipped cream or perhaps in a margarita or other cocktail. Slice the peel off of the oranges, being careful to remove all of the bitter white pith. Section out the orange slices and set aside on a paper towel to drain. Whisk egg yolks, sugar, wine and rosemary syrup in a stainless steel bowl. Place the bowl over a pot of simmering water, making sure that the bowl is not touching the water. Check periodically to see that the water is not boiling. Whisk constantly for 4 to 5 minutes, including the bottom and sides of the bowl. Cook until the mixture is thickened and expanded in volume. If you have a thermometer, you’re shooting for about 160 degrees. Remove from heat and continue whisking for a bit. Set aside to cool. Plate some orange sections and top with a luscious dollop of the Sabayon. Garnish with just a bit of pistachio if you choose. Serve immediately. Bring water and sugar to a boil. Turn down the heat and add rosemary sprigs. Simmer about a minute or so. Cover and remove from heat and let steep. Taste it periodically to decide on the strength you prefer. I let mine sit for the afternoon. Strain and store in the refrigerator in a clean, airtight container. 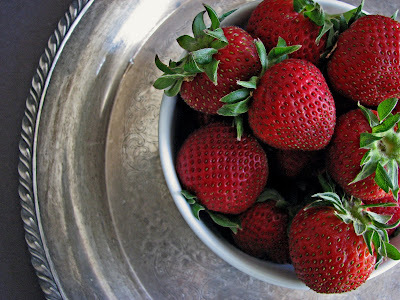 I spied the season’s first strawberries yesterday and grabbed them. 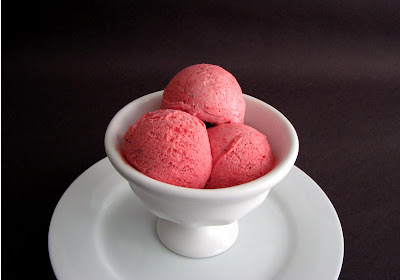 Bright red, plump and calling out to me for immediate purchase, my initial inclination was to make a sorbet. But then I remembered a delicious sherbet I’d had at a friend’s house a few years ago. It was a fresh and bright compilation of fresh strawberries with a splash of really good balsamic vinegar. Very simple and very much in tune with the best of spring’s bounty. This recipe comes together really fast - no muss, no fuss. The mixture is blended and chilled and then spun in your ice cream maker. Presto! Glace à la fraise, the essence of strawberries. 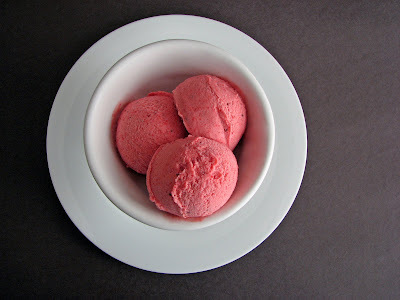 - Sherbet is a fruit puree to which a bit of dairy has been added. This is what differentiates it from sorbet, which is basically fruit puree and simple syrup. - If you happen to have a high quality balsamic vinegar, now is the time to use it. Combine fruit and sugar in a food processor or blender. Add balsamic and blend into a puree. Refrigerate for 2 to 3 hours. Strain the mixture if seeds bother you. Add cream and freeze in your ice cream maker. Voila! One of the first things we learned in pastry school was how to make praline powder. The praliné of my early lesson is quite different from the very sweet southern candies called pralines. Praline powder is a classical pastry element that is made by caramelizing nuts and grinding them in a food processor. It is used to flavor various creams, fillings and finishings. 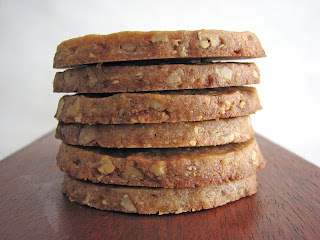 I’m using praline powder today to add additional crunch and flavor to a pecan butter cookie made with brown sugar. 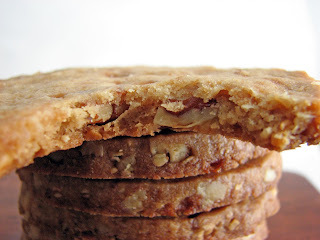 The caramel builds on the brown sugar taste and the toasted almonds add another source of texture. 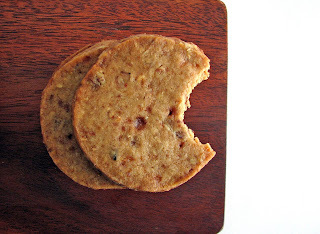 If you’re in the market for a buttery, nutty, crunchy cookie with a hint of caramel, this is the one. - Praline can be stored in an airtight container in the refrigerator for several weeks. You can use it to flavor hot oatmeal or fold into homemade ice cream. - To toast pecans, place on a baking sheet and toast in a 350 degree oven for about 10 minutes. Be careful not to overdo it or they will taste bitter. They will not look much different but will give off a lovely toasty fragrance. 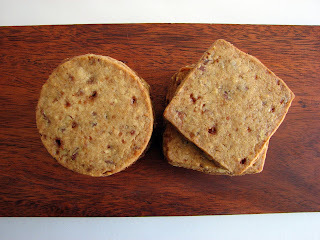 - Be sure that cookie dough is well chilled before baking so that the cookies hold their shape. You can also roll this into a log and slice and bake. - Yes, you can dip in chocolate if you must! Place sugar in a saucepan and add just enough water to cover it. Bring to a boil and cook without stirring until the caramel reaches the color of light honey. If it begins to only darken in spots, swirl the pan gently to distribute the color. Turn the heat down to low and add the almonds. 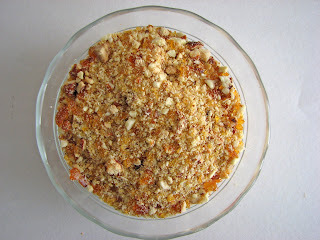 Cook for a few minutes, gently stirring with a wooden spoon to be sure the almonds are coated and the mixture is cooking evenly. Be careful not to stir too much or it may crystallize. When the nuts are toasted and the caramel is a darker honey color, pour out onto a baking sheet pan that is lightly oiled or lined with a silpat. Let it sit for about 30 minutes to cool and harden. Break into pieces and grind to a coarse powder. Beat butter and sugar until well blended. Add vanilla and rum or brandy. Combine flour and salt and add to the butter and sugar mixture until it's just beginning to blend. Add pecans and praline powder and mix for a minute. Work the dough with your hands to finish the mixing. Divide the cookie dough into two pieces and place each on a piece of plastic wrap. Top with another piece of plastic wrap and roll the dough out to 1/4” thickness. Chill until firm or overnight. Cut out cookies with a 2” cookie cutter. Place on a silpat or parchment lined baking sheet and bake @ 350 degrees for 13 minutes. Cool cookies completely before removing from the pan. They will keep in an airtight container for several days. As if.